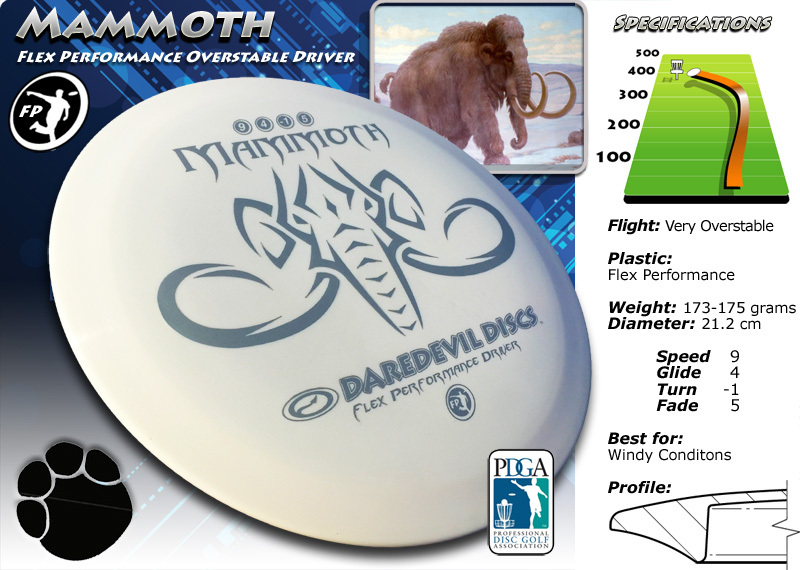 The Mammoth comes in Daredevil’s Flex Performance Plastic and offers a slight bit more Turn than the Sabertooth, but still has the same predictable Fade found in the Sabertooth. The Flex Performance Plastic feels great in the hand. to fly past the basket. GLIDE Glide describes the discs ability to maintain loft during flight. Discs with more glide are best for new players, and for producing maximum distance (especially downwind). Glide is rated from 1 to 7. Beginners looking for more distance should choose discs with more glide. TURN High Speed Turn is the tendency of a disc to turn over or bank to the right (for righthand backhand throws) during the initial part of the flight. A disc with a +1 rating is most resistant to turning over, while a -5 rating will turn the most. Discs rated -2 to -5 make good roller discs. FADE Low Speed Fade is the discs tendency to hook left (for righthand backhand throws) at the end of the flight. Fade is rated from 0 to 5. A disc rated 0 will finish straightest, while a disc rated 5 will hook hard at the end of the flight. Discs with a high fade rating are predicable even in wind. The mammoth was an enormous mammal that once roamed the vast frozen, northern landscapes. Adults often reaching heights of four meters or more. Their enormous tusks which would have been used for both digging and collecting food, and for intimidating and fighting off both predators and rivals. The tusks were often quite dramatically curved and could easily be up to 5 meters (16ft) long.